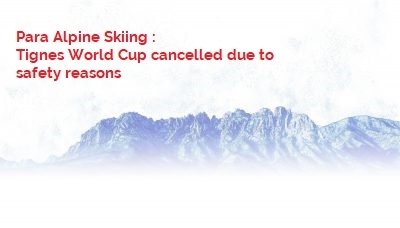 Large amounts of deep and soft snowfall in Tignes, France, has forced the complete cancellation of the fifth World Para Alpine Skiing World Cup, which was scheduled to run from 24-26 January. The Tignes World Cup was set to feature the first speed races in this season’s circuit, with two days of downhill followed by super-G.
Several metres of snow had accumulated on Monday (22 January) and initially forced the competition to be postponed until Wednesday. The next and final stop on the circuit is in Kimberley, Canada, where the World Cup Finals will be held from 8-11 February. Races will be held in super-G, giant slalom and slalom events. That will be the last stop before the PyeongChang 2018 Paralympic Winter Games on 9 March.